As winter approaches in the Southern hemisphere, the starry skies become an obvious feature of any safari – bush or beach. Here Dr. George Tucker shares some insight into the night sky that can help you enjoy,understand and share with your guests. Guides who live under the pristine skies of rural Africa sometimes take the view for granted and fail to realize how awe-inspiring it is to guests who reside in cities in North America, Europe and Asia. The primary reason the night sky looks so different to these visitors is because the very dark sky allows many fainter stars to be seen. 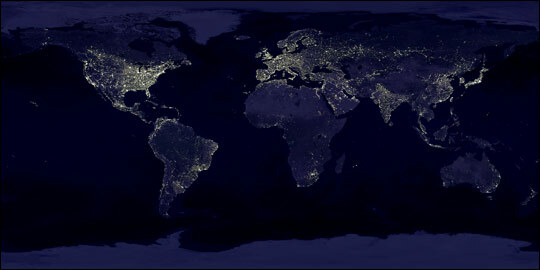 The image below is a composite photograph showing the Earth at night as viewed from a satellite. The brighter areas are due to light pollution caused by artificial lights shining upwards. Some of that light reflects back downwards off particles in the atmosphere making the night sky glow to observers on the ground, a phenomenon referred to as artificial sky glow. Another factor that enhances the nocturnal view is that the air in much of Africa is drier that that found over many of the heavily populated areas of the northern hemisphere. Since water vapor absorbs light, dry air causes the stars to appear brighter so fainter stars are visible to the naked eye. To quantify the differences, from some of most light polluted areas less than 20 stars are visible in the night sky while from areas with minimal light pollution, such as those found in rural Africa, observers with exceptional eyesight can see more than 4000. The dark clear skies also allow fainter meteors and satellites to be observed, so seeing them is a common occurrence. Finally, the higher an object is in the sky, the better it can be seen because its light passes through less atmosphere en route to the observer. Being south of the equator means sections of the sky that are near or below the southern horizon for observers in the northern hemisphere are much higher in the sky for observers in Africa. For example during the winter months the center of our Milky Way Galaxy, located in the constellation of Sagittarius, is near the zenith in East and Southern Africa but very low and barely visible in higher northern latitudes. The paths of the Sun, Moon, and planets also higher in the sky making them easier to spot, for example Mercury is difficult to see from northern cities is at some times of the year it is easily seen from Africa. All these factors combine to allow a variety of celestial objects that are seldom seen in the northern hemisphere to be easily observed from Africa and offer an exceptional opportunity to introduce guests to them. Surveys have indicated that a large percentage of the general public in many countries have a strong interest in astronomy and space, so your audience should be very receptive to learning about the night sky – or even just watching. During the past nine years, I’ve introduced thousands of visitors from the northern hemisphere to the wonders of the African skies and virtually all of them have been enthusiastic about the experience with many saying it was a highlight of their trip. The night sky also allows guides to introduce guests to another aspect of African culture, the ancient star lore, myths and legends associated with the sky. Views of the night sky from rural Africa are virtually the same as those seen by the earliest humans to occupy the area thousands of years ago. It was these views that inspired many of the myths and legends that form an important part of Africa’s cultural heritage. For example, while explaining that the dark lanes in the Milky Way are dust clouds created by dying stars will appeal to the guests’ scientific curiosity, adding that many Africans see them as forming the figure of an ostrich allows them to connect with the emotions early people experienced when viewing these fascinating objects. Dr. George Tucker is a retired American professor of physics and astronomy. His research interests include the remote sensing of planetary atmospheres and asteroid occultations and he has received numerous fellowships with NASA and the United States Air Force. An experienced astronomy educator, since 2003 he has spent a total of over two years doing astronomy programs and training guides at more than 20 lodges and camps in Southern and East Africa. Future articles will discuss in detail astronomical objects that can be observed with the naked eye or binoculars, coming astronomical events of interest, African star lore, how to plan an viewing session for guests, and the threat light pollution poses to African night skies and ways to prevent it.